An ACC integration will need to be set up prior to submitting claims for approval. For more information, see Setting up ACC Integration. In order to start submitting ACC claims for approval, an ACC Case will need to be set up within the client’s Profile. See Setting Up an ACC Case for more details. Once the Integration and the Case have been set up, it will be possible to enter Pre-Submitted Claims or to submit New Claims to ACC for approval. Below explains how to add a Pre-Submitted claim. For more details on adding a New Claim, click here. Pre-Submitted Claims are claims already submitted to ACC for approval via paper form or other ways than Nookal. 1. 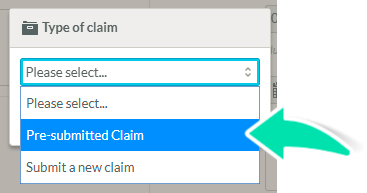 In the ACC Claims section in the Client's ACC Case, click on Add Claim. 4. Add the unique ACC 45 Number provided by ACC. 7. Click the Plus icon to add a Diagnosis Code from the drop-down list. 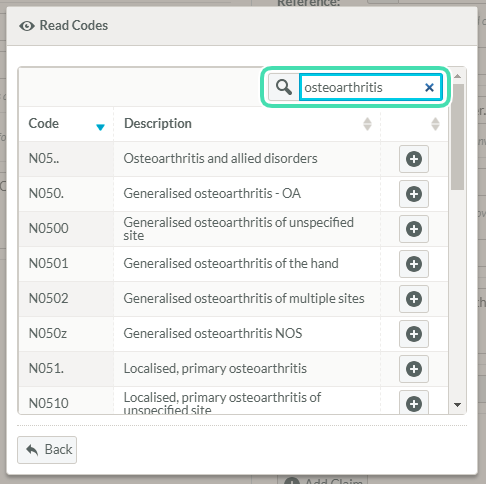 Use the Search Field to filter the Code and easily find the Diagnosis Code needed. 8. 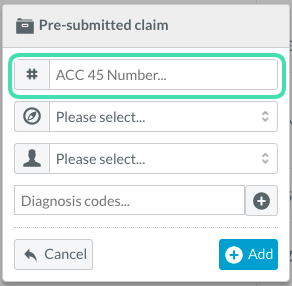 Click the Plus icon to add the Diagnosis Code to the claim. More than one Diagnostic Code can be added under the same claim if required. They will show in the filed under the Provider. 9. Once all the details have been added, click Add to finish adding the Pre-submitted claim to the Case. The claim will appear in the ACC Claims list with the Status Pre-submitted claim. Once ACC has approved the claim the invoice will be ready to be submitted, see Submitting Invoices to ACC.